Eitan out this afternoon in a "flash mob" (he hates it when I say this) when the teenagers text each other and meet an hour later. Today it's Kingston where they wander about, looking at shops, no money or at least limited funds. Maybe a snack then home. Tonight he will hang out with his Sheen Mount crew but no trick-or-treating. Those days long gone. Madeleine spends the day with Sonnet at the V&A (last day of half-term break) finishing homework and hanging out with mom. 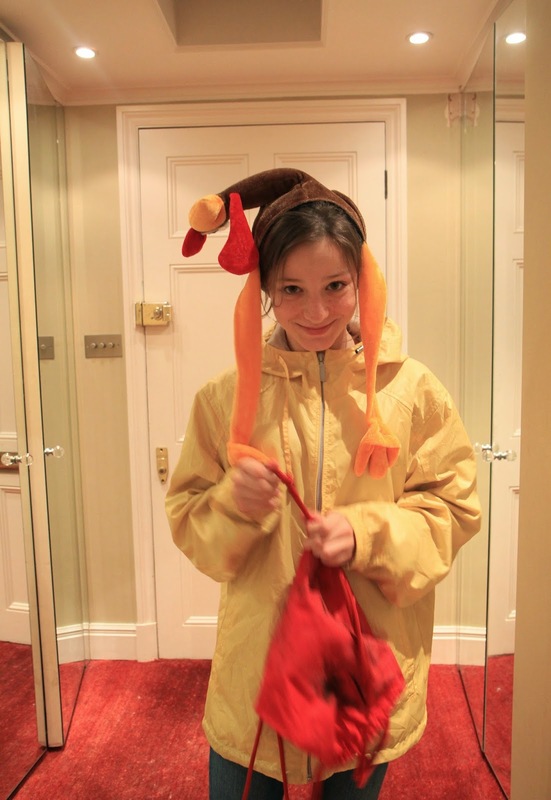 Tonight she hits the block with Abby resurrecting the chicken-hat which, dear reader, was my long-running costume when the children were children and not so embarrassed by such things. And then they were. We slip into Friday evening and it is my once favourite holiday, Halloween, before it become somehow commercial, even in the UK. Even in Tokyo. I liked the unsettling nature of the transitional autumn heading into the dead zone of winter and what better way to celebrate than trick-or-treating? Usually I try to watch at least one scary movie to put me in the mood but now not so much. Maybe it is in line with my mood these days - who needs more death? In any case, our block doesn't receive much attention from the candy crowd as there are more elderly folks vs. families. No kid wants fruit in their bag. Shinjuki, which is a large business, entertainment and shopping district centered around JR Shinjuku Station. It's the busiest train station in the world with 3.64 million passengers a day. Due East is Kabukicho, Asia's biggest red-light district. Shibuya, a large shopping and entertainment district best known for the Shibuya crossing, which is the busiest pedestrian crossing in the world. Estimates are that almost 1 million people cross the street here each day (2.18 million people use Shibuya station daily). Tokyo Station Area (Marunouchi & Yaesu), which handles over a million passengers a day. It's Tokyo's intercity rail hub connecting Tokyo with the rest of Japan by Shinkansen (bullet train). More trains pass through Tokyo station each day than any other station in Japan. My hotel, the Shangra La, located nearby. We also visit the Park Hyatt, where Lost In Translation filmed, and dine at Gonpachi made famous in Quentin Taratino's bloody Kill Bill. We enjoy a robata style dinner, which is similar to barbecue, where the food is skewered (often alive, brutal) and slow-grilled over hot charcoal. Traditionally the servings are a combination of seafoods and vegatables while we have shrimps, beef and .. fish. The ingredients displayed, and cooked, before us ("Like a puddle" our host helpfully tells us) interrupted by a traditional Japanese dinner chant complete with brusk clapping. Robataya is one of the best restaurants in Tokyo. 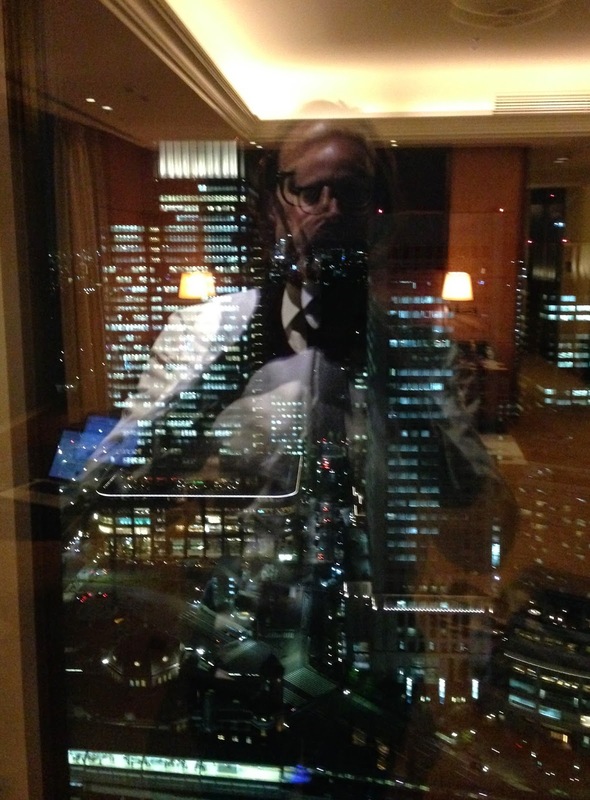 I arrive in Tokyo for business, meeting Thierry at the hotel and off we go. It's my first visit Tokyo and the city is BIG - the most populous metropolitan area in the world with 37.8 million people. From the 33rd floor of my hotel, Tokyo just goes on forever. Tokyo has eaten everything around it due, mainly, to the decision to build the Shinkansen (or "new trunk line"), a network of high-speed lines in Japan that opened in 1964 weeks before the Tokyo Olympics. The Shinkansen owns 1,483 miles of lines with max speeds of 150-200 mph. It links most major cities on the main island, making Tokyo ever more important as the central force of the economy while weakening regional cities. By an odd quirk, employers pay for the commute time making a 2 hour one-way somehow tolerable or even desirable. Any case, it carries over 300 million passengers a year. It runs like a Swiss clock. I watch the World Series, game 5, which is broadcast on Japanese television delayed for prime time (Giants beat KC, 5-0. There will be a Game 7). The commentary is in Japanese. I note that restaurants and bars are showing the game to locals who watch, enthralled. No surprise, either, since baseball introduced to Japan in 1872 by HOrace Wilson who taught at the Kaisei School in Tokyo and the first baseball team here was called the Shimbashi Athletic club in 1878. Madeleine's half-term break takes her to Madrid, where she flies in Monday until last night when I scoop her up from T5 followed by a late dinner. She is a chatter box, filled with enthusiasm and good cheer. In Spain, the school group stay in the Sierre de Gredos mountains: "very hot and sunny, mountains everywhere. Streams and lakes, too, along with forests". 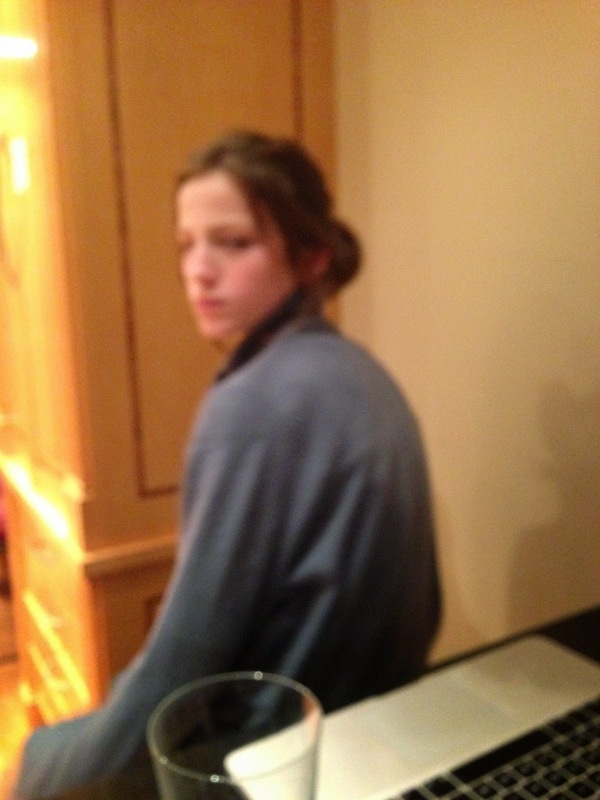 Madeleine bunks with nine other girls and gets maybe four hours of sleep despite the designated curfew of 23h30. During the week, the kids horseback ride, hike, mountain bike, enjoy archery and visit Real Madrid football stadium. In addition, for us parents, there is an hour and a half of Spanish lessons per day (Madeleine groans). Madeleine tells me the best part of the trip was "playing 'Slender Man' at night, pitch black, through the forrest, with my friends." (Slender Man, dear readers, is when the Slender Man, dressed in dark clothes, try to capture the non Slender Men; once captured, the captured join the Slender Men or the chasing team. Or so I think). I prepare for Tokyo tomorrow. 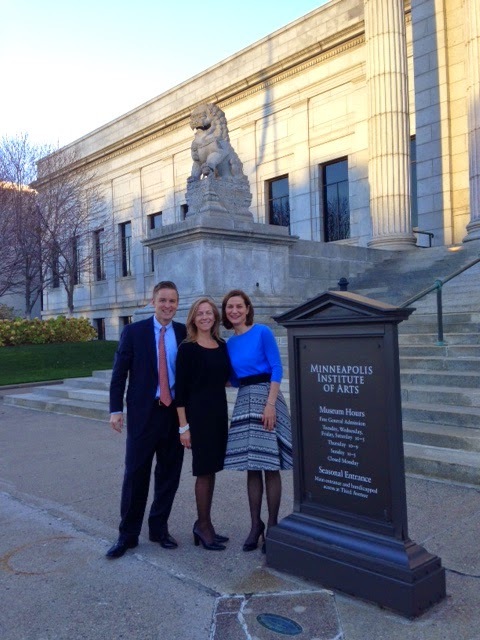 Sonnet is in Minneapolis St Paul for the opening of Italian Style (renamed from "The Glamour of Italian Fashion" for the Americans") at the Minneapolis Institute of the Arts. Eitan joins her from some mother-teenager bonding, and are hosted by the Bransfords who roll out the red carpet. Recall Mike and Gretchen part of our original ex pat group, post business school, who returned Homeland maybe ten years ago. Bill and Whitney join for the opening and it is a family affair. As Madeleine has been in Spain this week, I am solo for several nights. I take advantage by catching up on work, a trip to Manhattan where I see Katie, and going to the Egon Schiele opening at the Courdault. Eitan celebrates his freedom - half term! - watching football from dawn until dusk (right now it is the ever important match, Stoke v. Swansea). In between televised matches, The Sheen Lions take on KPR and win 3-2 on a nail-biter though the Lions outplayed their opponents. Dear reader, Eitan began his club play with KPR and there are a handful of kids that I recall from Eitan's very first competitive run down the pitch with the Rangers. Sonnet and I go to yoga which is something I have not done in, like, three years - shocking, really, as yoga was once an important part of our routine. Back in the early days of our relationship, ca. 1993, Sonnet introduced me to Bikram yoga in North Beach - it was their second studio though now they can be found everywhere (though Bikram's system has come into question). I still can't do the balancing poses and I sweat like a maniac. Me: "Why don't you you put on some NFL?" Eitan: "Do I have to?" Me: "Let's watch some real football." Me: "Who do you think would win - the Baltimore Colts vs Man U in soccer or vice versa?" Eitan: "Well it depends on who is playing. But, um, probably the Colts." Me: "Manchester wouldn't make it through the fist quarter. Look at how big the players are." Eitan: "It probably wouldn't be pretty." Madeleine wraps up top place. Friday night and everybody has been working hard. Since Sonnet out and Eitan at football practice, Madeleine and I have a date: Praline's And Cream ice cream+several episodes of "Modern Family." Doesn't matter that s/ we have seen every episode maybe more than twice, it is still funny and shows us what the 'normal' is. I take Madeleine to her drama class in NW London where today she "goes over a script called 'The Accident'. I play a guy named Dillon, who is the director of the play. The play is a 'play within a play.' We had to perform the play without props and costumes as the the van (in the play) gets into an accident and loses all of the props and costumes. Yep, that's it. That's what we did." Intriguing. During the interim I visit Panzers in St John's Wood. Panzer has the lock on American food for homesick ex pats. Like me. I pick up Captain Crunch, Fruit Loops and Nestle chocolate chips for (maybe) chocolate chip cookies. The kids are now officially on half-term break which means I find Eitan flat on his back on the couch, television on, dull lifeless look on his face. I join him. Julian is a potter. He makes pottery in his studio in Dulwich. 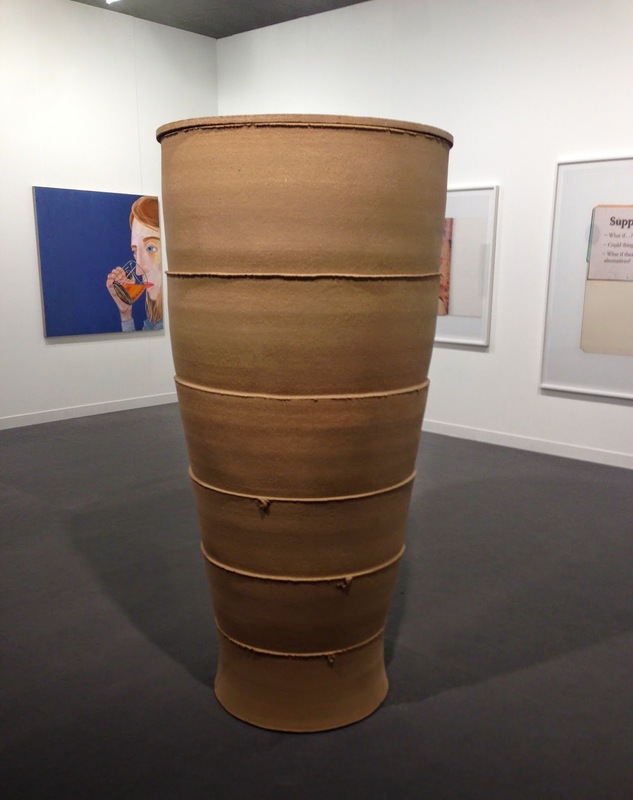 The pot on display, pictured, was made as part of a 2012 series of over-sized urns. In order to fire them, Julian found a special kiln in North England. Just getting the things there, and back, a challenge. 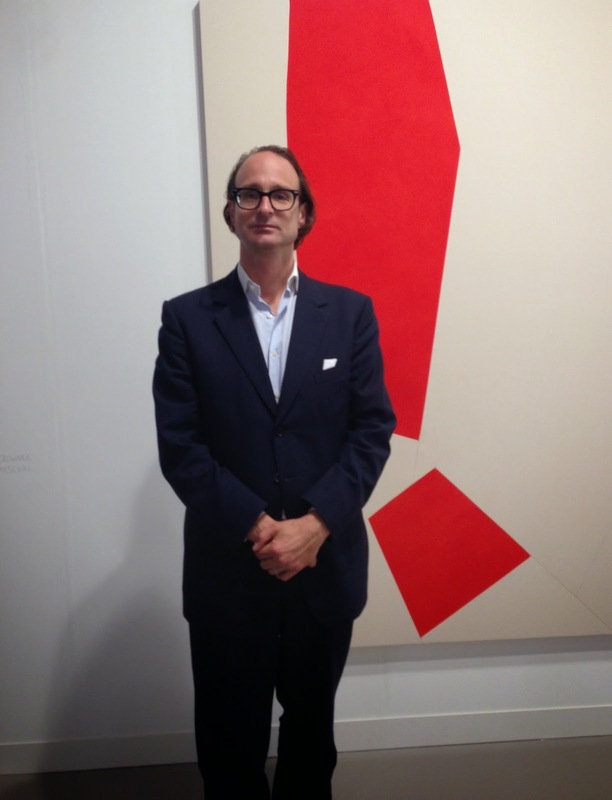 Now one is on display at the Frieze Art Fair. Many years ago we introduced Julian to Scott who is on the acquisition committee of the Rhode Island School of Design museum - RISD commissioned a tea set. Sonnet returns from Milan and Rotterdam where she gave a lecture at Palazzo Morando and attends a fashion conference at Erasmus University. She has a five hour dinner with the conference speakers in a renovated train terminus in a gritty but up-and-coming part of Rotterdam. They discuss fashion, mega egos and prostitution (Sonnet tells me). Not my usual conversation about private equity. calendar and an international contemporary art fair that takes place every October in Regent's Park. It features more than 170 contemporary art galleries and their works from Damian Hirst to Alberto Giacometto. But it is really the people watching that is most fun. There are a lot of French collectors for some reason and of course the Good and the Great, but also the artists and the strivers. Everybody dressed to impress and having a good time. Modern life. 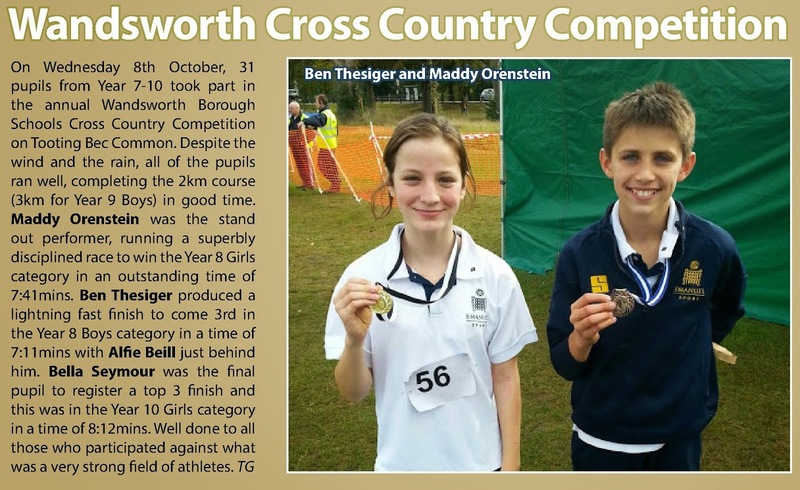 In my absence, Madeleine runs the Wandsworth Borough 2K around Tooting Common for Years 7 and 8s. Our gal finishes third of 120 runners and first in her age group (Text to Sonnet: "I came first out of everybody!!!!"). The Shakespeares trial track teams in Wimbledon and Kingston (Madeleine wants the former, Eitan the latter. Of course). In school news, Madeleine nails the never ending Tudors with a score of 97% on a mid-term exam while Eitan delivers results with top marks in biology, physics and chemistry. Even better, they bring their subjects to the dinner table. I return from the West Coast and spend the weekend catching up with family, yard work and soccer which sees Eitan in only his second Sheen Lions match of the season. Pictured, vs Shelton, who is top of the league and a full head, on average, taller than the Lions who go down 3-1 (but in fairness should have drawn on a goal-line block and goal bar strike). Eitan scores the Lions goal. California (San Francisco, Menlo Park, LA and Newport Beach) is filled with business meetings and friends including an evening with my Berkeley pals at Pizzaiola in a trendy neighbourhood in Oakland. Everybody doing what they should be: Ivor overseeing major architecture projects in San Fran and the peninsula; Mike and Tyler representing the Winklevoss twins of FB fame; Debbie is a local theatre legend and Eric is the Associate Commissioner of the Pac 12. Secretly or openly we all wish for a Cal Rose Bowl but it ain't ever gonna happen. Christian and Lisa show me a special evening in LA with a sunset drink at the Wilshire Hotel overlooking the Hollywood Hills, than a pre dinner cocktail at the LA County Museum of Art, followed by dinner at a local Terroni. Fabulous. Newport is a strange alternative lifestyle: alternative for the rich and super rich. It keeps its beach culture but the harbour yachts stuff the gang planks. Surfers walk along the high street where I have coffee; the black Bentley driven by the housewife somehow out of place in the glorious sunshine. I bring home a stack of comic books for Madeleine.